It used to be under Barili, until in 1850 when the area under the Sta. Monica Church was declared parish. 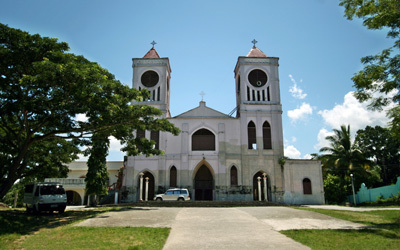 Standing tall over a century as a symbol of the Pinamungajanons’ deep faith in God, the parish was first served by a certain Fr. Feliciano Fuentes. The church, made of coral stones during the Spanish period, houses the image of Santa Monica and four church bells with Spanish inscriptions.